Random Thoughts of Gil Camporazo: 3 Little Kids Aren't Home Yet! Where Are They? 3 Little Kids Aren't Home Yet! Where Are They? Our three little lovely grandchildren failed to go home after their classes in the afternoon. They're supposed to be off in the school at 3:30 p.m. and by 4:00 p.m. they should be home. But it's already past 5, and they're not home yet. 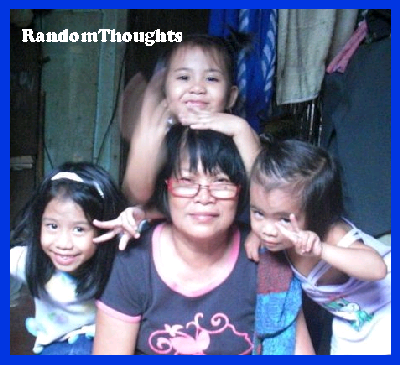 Their grandmother, Rebecca, my wife, was alarm and puzzled about this for these kids were staying at home during the school days and they went home to Brgy. La Granja, La Carlota City (home place of my wife) during weekend. Adgel and Shanely Jane, 8 years old, were grade two pupils and they're cousins, and Stephanie Gyn, 6, grade one was the youngest sister of Shanely Jane. They're all studying in La Carlota City Elementary School I, a walking distance from our residence in San Agustin Street, La Carlota City. In their earlier school days, every afternoon, they're fetched by their respective parents, Dona and An An. When they're not available, Rebing did in fetching them. Now they almost used to go home together by themselves. As I've said, our home is very near. They would take around 10 minutes to walk back home. They would have to pass Burgos Street, then turn to the left passing San Agustin Street. That's when they take the regular route. But when they take a shortcut. They would pass the adjacent school, La Carlota North Elem. School, passing to the back gate. 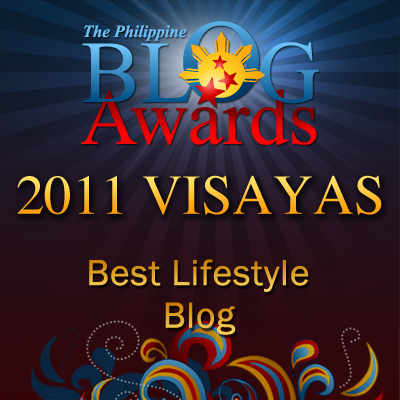 Then they would pass Locsin Ledesma Avenue. They turned left to San Agustin Street. It's a matter of 30 steps to our home. Rebing stopped for awhile in her laundry task when she noticed that some of the school children who were our neighbors, were already home and our three school goers weren't home yet. She checked the time. It's almost past 5 p.m. She was worried why the kids are not home yet. She set aside her washing work and prepared herself to go and bring the kids back home. When she arrived there, no kids were around. She asked every person she met if he/she found a primary graders, aging 6 and 8. She received no information. Her worry became tense. She took the shortcut to La Carlota North Elem. School. 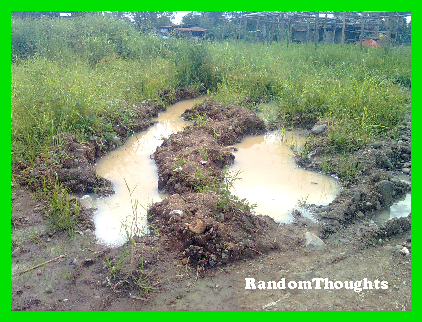 When she went out to the back gate of the said school, at afar off, just across the street of Locsin Ledesma, she saw the kids playing in the muddy puddle or pothole created by a mark of a heavy duty truck while Panyang, fond name of Stephanie Gyn, standing at the dry ground that separates the two potholes, was crying. She came over to them. "Why are you crying, Panyang?" asked Rebing. "I lost one pair of my sandal in the 'pond'," replied Panyang while pointing to the left "pond." "Don't worry. I will look for it," assured her grandmother, Rebing. Rebing went down to the nearly knee-deep puddle on the left as directed by Panyang. While bending, she dipped her bare hands to the murky water of the pit and kept on searching the missing piece of Panyang's sandal. She took several minutes to do it, but no sandal. She ventured to the right pit. Still the same, no sandal found. It's getting dark and she almost gave up, but she overheard Panyang was still crying. Well, she went back to the first one. This time she used her bare foot to trace the under the water of the pothole. Yet nothing happened. She did it again still no sandal. Well when she almost wanted to give up, she stepped on a bulky object underneath. She bent and touched it with her bare hand. Eureka! 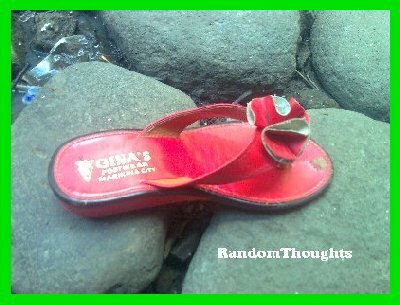 It's the missing sandal. Then Panyang stopped crying and grinned. They went home together. Rebing was full of mud and the three kids were also full of mud. They're looked like a Circus clown. When I arrived after a day's of work of that day, Rebing rehearsed everything to me on what a funny thing happened to the kids and to her. "Though it's funny, but you did a good job!" I told her while laughing for I imagined how she looked like while staying and searching the muddy holes for several minutes until she found the lost sandal. I called up the three kids. Let them sit on the bed side and counseled them. I reminded them to go straight home after their classes especially in the afternoon. They won't waste time in dropping by anywhere. During weekend, I will give them enough time to play. And they all agreed and said sorry for the things they've done. Well, as a matter of fact, what they did wasn't unusual for us. It's a common activities we did when we're in their age too. I remember when I was in Grade One, I used to spend my after class playing in a canal, catching fry (small fishes) and tadpoles. An An, the mother of Bulaklak, fond name of Shanely Jane and Panyang was doing that dirty work too. I remember that Rebing and I fetched her in school for she was unable to go home on time in her last period class. We saw her together with her nephew, Benjel was playing in ankle-deep water canal, catching tadpoles too. I know that's how the kids love to play. They love to explore things especially a body of water. They're curious. No wonder why! I would also be worried when my kids aren't home on the usual time. It's scary if kids don;t go home immediately after school these days but good thing they know how to enjoy the outdoors as most kids now are so hooked on games and techie stuff. times nowadays is no longer safe unlike before, if i were in your wife's shoes i will also do the same thing, look for the kids at once. Glad the kids are safe. With the news of children being kidnap in the street of Manila it is really alarming if they're not home yet on the expected time. When I was young too I also used to catch tadpoles in the canal, the fattier the happier I am. Lol! Sometimes, I miss being a kid. A time where I can play with mud and dirt and no one will curse me for that, they will just laugh at me because of the the dirt all over my face. i would also be worried if my kids won't arrive at the time they are expected especially nowadays. glad they were alright. Yahweh bless. happy,your kids are safe.We always need to be protective about kids,they do all thing as funny as its in their age.